If you or a veteran you know suffers from PTSD and needs help call the national hotline at 1-800-273-8255 or go to www.ptsd.va.gov. 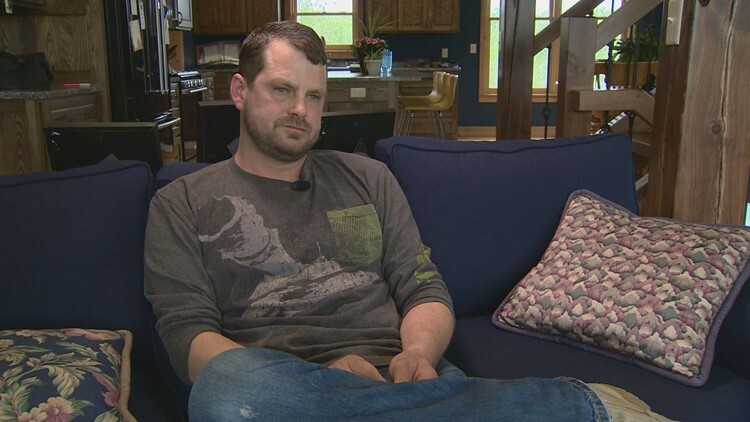 SANDSTONE, Minn. – Two decades after he served as an Army infantryman in the first Gulf War, Brian Zimmermann’s body began to betray him. His hands began to swell so severely, he could barely complete his work running a blinds installation business in Sandstone, Minnesota. His muscles would involuntarily spasm, and bruises would appear where his joints and muscles throbbed with excruciating pain. At night, he couldn’t sleep, disturbed by night sweats, and what he described as a "lightning storm" in his brain. The pain triggered memories of his time serving in Desert Storm, he couldn’t shake the images of the lives lost in a bloody battle in the 1991 Gulf War, known as the "Highway of Death," between Kuwait and Iraq. The face of a little girl he witnessed during the devastation of that day haunted him in his dreams. It turns out, Zimmermann’s fellow Army veterans were experiencing the same mysterious symptoms and over a two-year stretch, several people in his unit took their lives. Zimmermann, 47, understands why, at points in his own struggle, he’s stared down into the same dark place. Two years ago, Zimmermann just happened to visit a traveling military memorial that stopped near his Minnesota town. 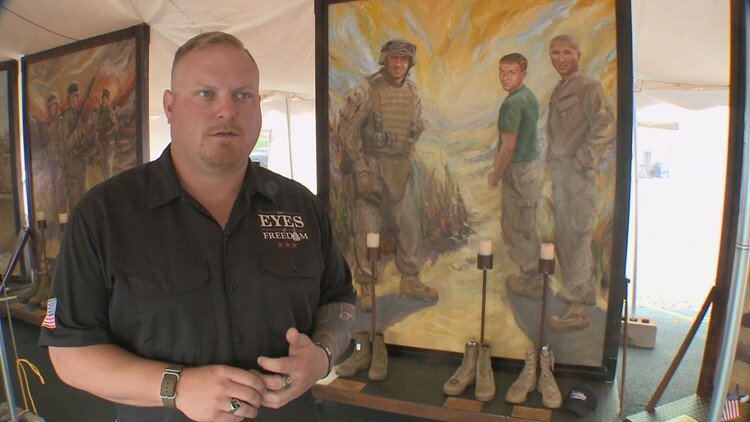 The Eyes of Freedom features 23 life-size portrait of the fallen Lima Company marines, an Ohio marine reserve unit among the hardest hit in the Iraq War. Overcome with emotion after seeing the faces of the fallen, he turned to leave, but was stopped by Mike Strahle, a Marine veteran in charge of taking the Eyes of Freedom memorial from state to state. Strahle narrowly survived the roadside bomb that killed many of his fellow Lima Company marines. He saw a familiar sorrow in Zimmermann’s eyes that day, and struck up a conversation with him. Their friendship was born in the presence of those paintings. “We have got so many veterans are choosing the wrong way out, that’s a tragedy in of itself. Meeting Brian and hearing Brian’s story was, I guess, the final straw,” said Strahle. Strahle introduced Zimmermann to the artist who spent several years painting the Eyes of Freedom memorial, Anita Miller, 57, of Lyons, Colorado. Miller was seeking a subject for her next project. She wanted to unveil a life-sized sculpture of a veteran struggling with PTSD. She had never undertaken a sculpture exhibition before, and when Strahle told Miller about Zimmermann’s story, she knew the Army veteran from Minnesota was the subject she had been searching for. “Anita asked me what I would have done to help one of my brothers that I served with? I said I would have done anything to help them, and then she said, 'You have to do this,'” said Zimmermann. That day, he made her a promise, despite his own despair, he would live to see the project through. Miller met Zimmermann on a trip home to visit family in her native state of Minnesota, and spoke to him often by phone. She studied his photos. She asked him to measure details, like his swollen hands. She then began to sculpt from a life-size model of Zimmermann from her studio from Colorado, a project that would take two years from start to finish. Miller initially envisioned a solider looking upwards, into the light. Zimmermann told her veterans wouldn’t connect with an optimistic pose. 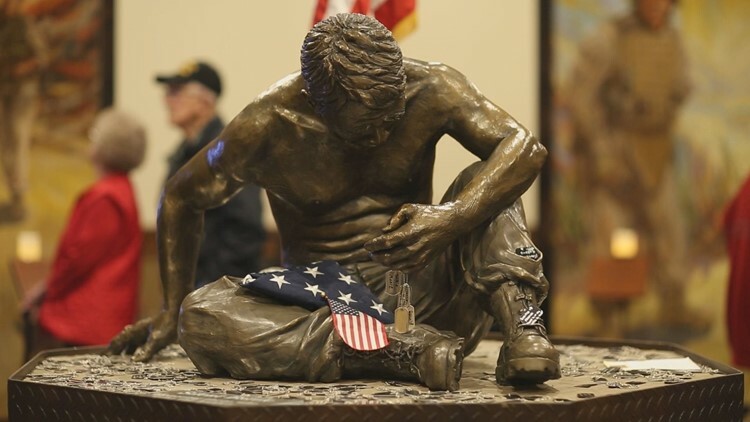 He told her to speak to veterans, her sculpture must capture sorrow and defeat, so Miller scrapped her initial plan and began again, closely channeling Zimmermann’s own journey with PTSD. “I think the pain just renders a person silent,” said Miller. Zimmermann is one of many Gulf War veterans participating in new studies at the Minneapolis VA Medical Center, where researchers have found differences in brain patterns of veterans sickened by Gulf War Syndrome. In collaboration with the University of Minnesota Brain Sciences Center, VA researchers found a shrinking of the cerebellum in the brains of veterans sickened with Gulf War Illness, when compared to healthy veterans, what they believe is due to antibodies possibly linked to vaccines veterans received before deployment overseas. A new report just outlined a breakthrough in the study of sickened Gulf War vets, and a possible path to treatment. It found brain cell damage from Gulf War Syndrome can be reversed and neutralized by a healthy serum. “All of these negative effects were reversed when healthy Gulf War veterans’ serum was added to the cultures. We conclude that Gulf War Illness serum contains brain damaging factors that can be neutralized by healthy serum, possibly by specific antibodies,” according to Dr. Apostolos Georgopoulos, of the Brian Sciences Center, who led the study. Brian Engdahl, Ph.D., is a VA researcher and psychologist in the Brain Sciences Center, part of the team leading several studies, considering factors like toxic exposures during the way, along with health history, immunity, genetics and brain scans of veterans. Engdahl and fellow researchers recently analyzed approximately 240 Gulf War veterans, with a goal of studying 1,000 Gulf War veterans over the next three years. The study began eight years ago, and now Engdahl is searching for more Gulf War veterans and funding to continue his breakthrough research. Zimmermann was among the first veterans to volunteer for the study, willingly undergoing brain scans and various tests in hopes to find relief for his pain. Engdahl points out that the brain scans of Gulf War veterans sickened by Gulf War Syndrome are now proof, showing differences in brain patterns and brain activity when compared to other veterans. Last year, the Veteran's Administration concluded in its most exhaustive study to date, that every day, on average, 20 veterans decide to end their own lives. In 2014, veterans made up 8.5 percent of the population, yet they accounted for 18 percent of all suicides. Engdahl believes in a matter of years, the study could lead to personalized drug treatments for those struggling, and perhaps a blood test to remove doubt about who’s suffering from Gulf War Illness. “These are not cures, the doctors are doing their best to treat the symptoms and look for ways to stop the misbehaving immune system,” he added. Engdahl said an estimated $9 million have been funded so far, and his department is seeking another $7 million in support for the next phase. Two years have passed, and Miller’s vision is finally realized. The sculpture of Zimmermann is now in a foundry, ready to be dipped in bronze, and soon unveiled. “Brian is the inspiration. This is his story. This image is an image that he shared with me, he wanted people to understand a little bit about what it feels like so it’s really my hands giving form to his pictures in his own mind,” said Miller. Miller had no idea the next turn her project would take, uniting a Colorado artist and a Minnesota veteran with an Idaho town. 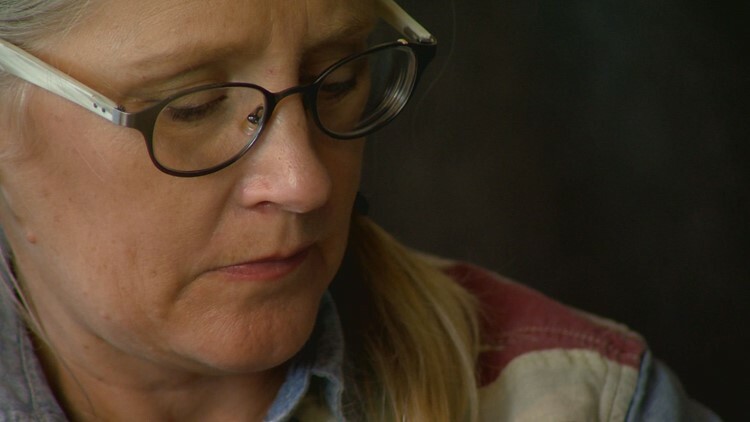 Sharon Ledbetter, of Lewiston, Idaho asked Miller if she’d be willing to unveil her sculpture in the military-focused community, with concerns the suicide rate for veterans is especially high in western states, such as Idaho and Washington. "We want this for our veterans, to help them and heal them,” said Ledbetter, who leads the Quilts of Valor chapter in her community. It’s how on a cloudy spring morning, a large semi-truck carrying Miller’s paintings and the newest sculpture made its way down through the canyons of Lewiston, Idaho. A parade of patriotic citizens lined the streets, waving American flags, and wiping tears, as the sculpture was tenderly unloaded for the unveiling and opening ceremony. “It's going to be very emotional. That face isn't going to be mine, it's going to be some other guys I know. I think everybody that will see the statue, will see a different face on it. I think that they will see the face they want to see. It's just a symbol,” said Zimmermann. Two years after Zimmermann’s promise to Miller, that he would live to see the unveiling, but he wasn’t prepared for the moment the sculpture, now titled “Silent Battle” would set him free. A black cloth was pulled back to reveal a soldier’s sorrowful face, light and shadows gleaming in bronze. It may be Zimmermann’s likeness, but the statue holds a universal understanding. Immediately, the image drew tears and awe from a packed room of Idaho veterans and their families. The Silent Battle sculpture will now tour the country, alongside Miller’s paintings. “It took a lot of burden out of my soul. I still lose sleep every night. I still have horrible dreams, but I am dealing with them different now. I made a big leap in the past year and I want to help other people make that leap. It’s time we step up and start helping each other,” said Zimmermann. Today, Zimmermann’s pain is more managed, his business is growing, and he’s found a purpose in helping other struggling veterans, in constant communication with fellow veterans who are struggling with PTSD. He plans to travel with the sculpture as often he can too, to carry the burden for his brothers and sisters, to help bring a peace far more everlasting than bronze. “I could not quit thinking about the war before. It overcame my entire being, and not the good parts, the bad parts. I was in a hole I could not climb out of, and now I feel like I have climbed out of it,” said Zimmermann. Editor's Note: This story was originally published in May 2018. Here's more information about the Eyes of Freedom and Silent Battle sculpture. If you or someone you love is struggling with PTSD, you can find resources at 1-800-273-8255 or www.ptsd.va.gov.